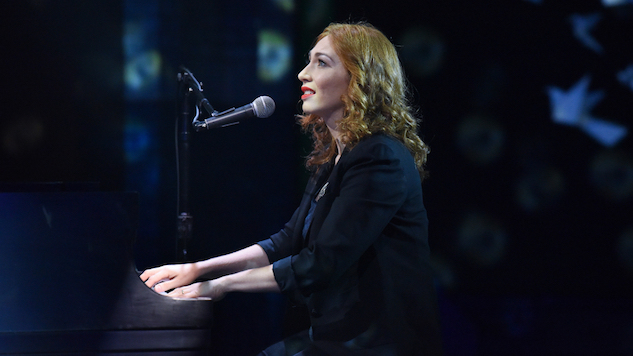 Regina Spektor first recorded her popular piano ballad “Samson” for her 2002 album, Songs. Four years later, she re-recorded it for the label-backed Begin to Hope, thusly giving it the spotlight it deserved. Today, it remains one of her most delicate, widely adored tunes, a gripping story told in just three minutes of keys and voice. “You are my sweetest downfall,” Spektor sings. On Monday, seated solo at the piano bench, she delivered an utterly chilling performance of the song on The Late Show with Stephen Colbert. Her Late Show appearance marked the first time Spektor has performed “Samson” on broadcast television, according to CBS. Watch it come to life below. Spektor also recently teamed up with Eastern European punk group Gogol Bordello for the title track on their most recent album, Seekers and Finders. Earlier this summer, she appeared in a music video for the song, which you can watch here. Spektor’s most recent LP was 2016’s Remember Us To Life. While you’re here, check out the highlights of her genre-spanning catalogue with our list of the 10 best Regina Spektor songs and read her 2016 conversation with Paste here.